With the rise of niche publications of all kinds targeting specific readers based on focused need, what does media visibility look like for professional services firms (including law firms and others) today? A piece on Fintech apps and consumer privacy by Kilpatrick received a link and mention in a Finextra blog post: Bank App customer are right to worry about their Personal Data. Finextra is: "the leading independent newswire and information source for the worldwide financial technology community. Finextra covers all significant technology news in wholesale and retail banking, the capital markets and insurance." A piece for broker-dealers covering recent FINRA regulation changes by Hardin Compliance Consulting became the subject of a post on Financial Advisor IQ: How B-Ds Can Comply With FINRA's New Registration Rules. FA-IQ is: "a free online daily news service written for Financial Advisors. FA-IQ is a member of the Financial Times family of news services covering the investment management industry." 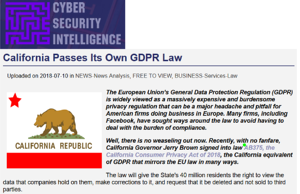 An analysis by Nelson Mullins of California's new consumer privacy act earned a link/reference in the opening paragraphs of a Cyber Security Intelligence news bulletin on the same subject: California Passes Its Own GDPR Law. Cyber Security Intelligence is: "a searchable news website covering topical issues on cybersecurity and intelligence, targeting senior general managers and specialists across the corporate & institutional sectors (mostly financial services, IT, security, government and policing)." What do these three posts have in common? Each provided timely news and/or analysis on a need-to-know matter of interest to a specific, professional audience. As such, they earned the attention of editors and writers at niche news sites, gaining even more visibility as they were used as source information for posts on those respective sites. Mainstream media pickup should remain a clear goal of your team's communications strategy, but so should this sort of targeted carry through with audiences in niche areas and sectors. Oh, and one other thing they share in common: all three made themselves available to these media opportunities by being published on JD Supra.